This is the ideal topic for us all to think about. We do it everyday, especially those of us that use the Internet the majority of the time. Web pages, business letters, articles, news releases, documentation and most certainly, advertisements. I have at times found myself proofreading our local newspaper..and suspect their proofreader isn't necessarily paying attention to his or her work. I have found scores of web sites with the same problem. Terrible spelling and common grammatical errors are high on the list. Of course, some of us do not pay attention to these little details, but entrepreneurs look for imperfections in a web page. Do we all know how to proofread? Not necessarily. Looking for misspelled words is scarcely enough to polish your workmanship and neither is applying capital letters where needed. I am touching the surface with the most common proofreading DO's. You might think a little differently the next time you do the job. 1] Always proofread when you are at your daily peak. In other words, do not try it, if you are sleepy or distracted.You will definitely miss a number of errors. Proofreading requires concentration. 2] Read the selection through and then read it aloud. Read it to a friend and have them read it to you. Read it backwards..that's what I said. You'll be amazed at the errors in spelling you will encounter. 3] Use your computer's spell checker,but do not rely on it.Often, there are times the checker will find errors but the word meaning is different, such as there and their. Use a dictionary to be sure of the correct meaning of a word. 4] The thesaurus is helpful,but again the range of words are limited,a book offers a broader list. Your choice of words does make a difference when others read what you have to offer, so go ahead and be choosy. 5] Be sure all beginning letters of a sentence are capitalized.Names of importance, within the sentence are a must to remember. 6] Look for sentence fragments, run ons and match subjects with verbs. Other important points in addition to the ones above are included below. These are not to be excluded and you may think this is a lot of unnecessary work, but isn't your piece important. You wouldn't be writing it, if it wasn't. 1] Do you have enough ideas incorporated into your selection? 2] Be sure you are not wandering away from the thesis. 3] Are you proving your point and is it interesting? 4] Is the content in order and does it flow smoothly? 5] Answer the following questions when you are proofreading. If one of these are missing, then you need to go back and revise. All of the above tips for proofreading are of the upmost importance even on a web page of your web site. The following tips are also helpful in the finishing touches of your site. 1] Start your inspection by checking to make sure all links work. 2] Look at the text and see if it is readable. If you can't see it,others cannot read it. The background may not be suitable. 3] Verify that all your information is up to date. 4] Is all the information in a sensible order, and delete or add information. 5] Use the scroll bar on the side to view one line at a time, either from the bottom or top. I find this very useful when reading, etc. Proofreading has a nature of time consumption and if you do not have the time, find someone that does. It will boost your sales and your site will have a look of a professional. 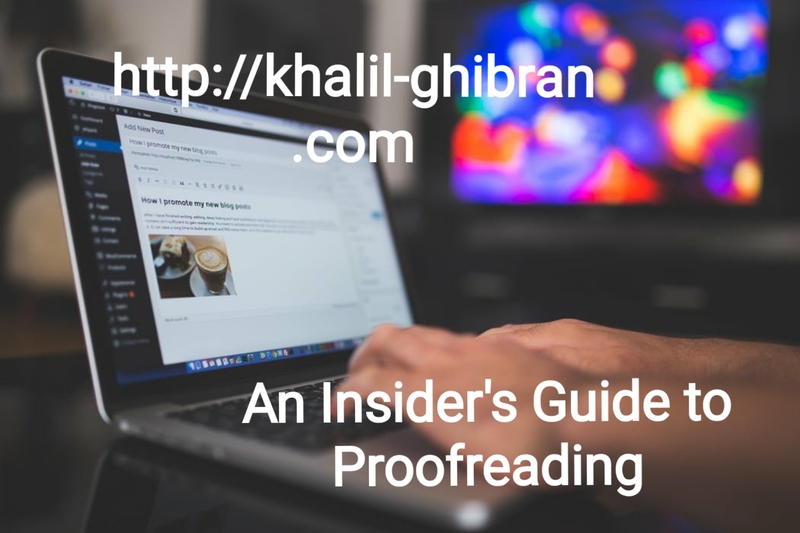 I am not a professional and never claim to be, but I will proofread the following types of content, sent by email if you want a little help. I am not charging a enormous fee for the service. I have an Associate Degree in Accounting, and extensive courses in English, Business Communications, Ethics, and Public Speaking.